Had a busy time in Albuquerque. Lots of chores to do - a new fridge fitted, new tires for the RV and for the bike (already!!). But we still had time for some fun. Did a couple of hikes in the Cibola Nation al Forest - We rode up to Sandia Crest - a 16 mile scenic highway to the 10,000 foot peak overlooking the city and hiked from there. Or rather it wasn't so much of a hike as a 'trudge' - it was still pretty thick snow on a well shaded trail - at times knee deep! The view from the top was spectacular - that was moments before the cloud came in and obscured the view and treated us to a little snow in case we were in any doubt who was boss! Back at the bottom of the hill we stopped by a great museum - The Tinkertown museum. We've done our fair share of musuems during this trip but this was totally unlike anyth ing else. It was put together by an artist called Ross Ward who spent most of his life creating what today comprises Tinkertown. It started with a collection of miniture hand-carved figures back in the 60's and 70's which he travelled to carnivals and fairs to display. Now the museum is housed in buildings made of glass bottles (over 50,000 of them!) and is a crazy maze-like series of rooms with various collections - the original figures & old southwestern street scenes, circus scenes, a collection of wedding ca ke bride & groom toppers, antique tools, dolls, a 35ft boat (Which spent 10 years travelling the world - that's a whole other story! ), fairground entertainment - we had our fortunes told by 'Esmerelda', established that I should be a 'Dictator' on the career wheel of fortune and listened to music on the wurlizter! It was just an amzing place and such fun! You turned each corner never knowing what delights were in store and there was so much to see! We met Carla - Ross's wife. It was her brother Fritz that had travelled for 10 years in the boat. We chatted for a while about his travels - so interesting for us also being travellers! The boat he wasn't able to sell after his adventures so it took the trip across the land to settle forever in the Tinkertown museum. As we left Carla gave us a copy of his book - we haven't finished it yet but already it's such a fascinating read. Our second day being tourists we went downtown. 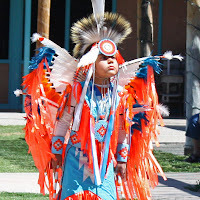 First to the Indian Pueblo Cultural Centre - we got there in time for the traditional dancing. There were just 5 dancers but they all performed different traditional dances - lots of fancy names which I'm afraid were totally lost on me. The costumes were what I loved the most - so colourful and vibrant and full of texture and flow as they moved! The rest of the centre was dedicated to the 19 pueblo villages that still exisit in New Mexico. Although they often get lumped together as similar cultures they are all quite distinct with a number of different languages and customs. We spent the rest of the day at the National Atomic Museum (it was here in New Mexico that the first atomic test bomb was exploded) and in the old town area - eating ice-creams in the shade of the trees surrounding the traditional plaza.